"He also served on the boards of the Institute of Cooperation in Space and the National Space Society, both of which advocate peaceful use of space technology." Arthur C. Clarke, author of 2001: A Space Odyssey and a man considered one of the world's top science fiction writers, has died. He was 90. An aide announced his death Tuesday in Colombo, Sri Lanka, where he had lived since 1956. 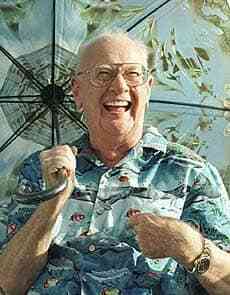 Arthur C. Clarke laughs outside his home in Colombo, Sri Lanka, in 2000. He died at 1:30 a.m. after suffering breathing problems, aide Rohan De Silva said. Clarke had battled debilitating post-polio syndrome since the 1960s and sometimes used a wheelchair. He enjoyed the diving in Sri Lanka, saying it was close as he could get to the weightlessness of space. A scientist whose work helped lead to the creation of modern satellite systems and early space exploration, his work bridged art and science. While making real advancements in technical applications, Clarke was a vocal advocate of peaceful use of space technology and his fiction imagined a more advanced form of mankind. Clarke was the author of The City and the Stars, Childhood's End and 2010, a sequel to A Space Odyssey, which was made into a movie by Stanley Kubrick. With Isaac Asimov and Robert A. Heinlein, he was considered one of the "Big Three" of science fiction. His fiction predicted space travel before rockets were even test fired and foretold computers wreaking havoc with modern life. Clarke was a lone voice of dissent when the world feared that the Y2K bug would lead to mayhem in 2000. Clarke was born into a British farm family in Somerset on Dec. 16, 1917. As a boy, he spent much time stargazing and he studied the space sciences after moving to London in 1936. He joined the British Interplanetary Society (BIS) and started to write science fiction, but was interrupted by the Second World War. He joined the Royal Air Force, where he became involved with experimental trials for radar. 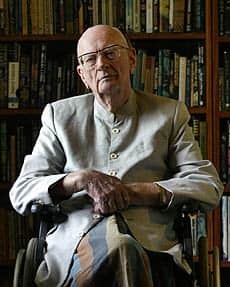 Arthur C. Clarke, photographed in his home library in 2007, had post-polio syndrome, and so used a wheelchair. His only non-science-fiction work, Glide Path, was based on his radar work. After the war, he became president of the BIS and published his landmark technical paper "Extra-terrestrial Relays," in which he first set out the principles of satellite communication using geostationary satellites. He finished his degree in physics and mathematics at King's College in London in 1948. He began working with U.S. scientists and engineers on the development of spacecraft and launch systems and in the 1950s he worked with the U.S. Weather Bureau to develop satellite applications for weather forecasting. At the same time, he was writing books and short stories, publishing his first story, Rescue Party, in Astounding Science in May 1946. In 1948, he wrote The Sentinel, the story that would be the basis for 2001: A Space Odyssey, for a BBC competition. He lost, but the story introduced the mystical and cosmic elements that would be his hallmark as a writer. Three of his novels advanced the theme that humanity is the property of an ancient alien civilization and that aliens will help mankind evolve to be higher species. In 1964, he started to work with Kubrick on the script for 2001, and in 1968, they shared the Oscar nomination for the screenplay. He published the sequel, 2010: Odyssey Two in 1985 and worked with Peter Hyams on the movie version. In television, Clarke worked alongside Walter Cronkite and Wally Schirra for the CBS coverage of the 1969 Apollo 12 and 1971 Apollo 15 space missions. He also hosted a 13-part 1981 TV series, Arthur C. Clarke's Mysterious World, that investigated unexplained phenomena and mysteries around the world, followed up by Arthur C. Clarke's World of Strange Powers in 1984. He also served on the boards of the Institute of Cooperation in Space and the National Space Society, both of which advocate peaceful use of space technology. He was vice-president of the H.G. Wells Society, dedicated to another British science fiction writer. He earned a British knighthood in 2000 and a science fiction writing award has been named after him.